Paul Bakaus & the jQuery UI Team has released a major update jQuery UI 1.5. $(â€divâ€).draggable(â€methodâ€) calls another method on the plugin. One of the great things in being able to take a step back is that it offers a totally different perspective on what a full-featured UI solution should offer. While jQuery UI v1.0 was currently offering a nice suite of UI controls, users were in need of solid effects like those offered in libraries such as script.aculo.us and jQuery UIâ€™s former inspiration, Interface. Unfortunately, Interface was no longer being updated which left a bit of a hole in terms of effects; hence a new project called â€œEnchantâ€ was born. Originally planned to be released as a complementary library to jQuery and jQuery UI, we realized that it made perfect sense to merge Enchant with jQuery UI allowing users easy access to advanced effects and UI controls from one solution. Weâ€™re proud to announce that Enchant is now a part of jQuery UI and jQuery users now have a unified solution for their effects and UI needs. The jQuery UI effects can be used standalone or together with UI and have a separate core which extends the jQuery core to introduce advanced easing, class transitions (morphing) and color animations. All effects are tightly integrated into the main API and can be used as standalone ( $(..).effect() ) or directly from within jQuery methods you already know ( hide()/show() ). Overall, we already have more than 15 ready-to-use effects for you to use in your projects, not only those provided by script.aculo.us (blind,bounce,drop,fold,slide â€¦), but also fresh, new effects (transfer, explode. clip, scale) that make jQuery UI a great library enhancing your applications! ThemeRoller is an application itself that allows you to create themes on the fly and save them out. The Filament Group did the work and blogged about how. Themeroller.com is throwing js exceptions in IE7. The accordion demo on there is also very choppy… I’m chalking it up to poor web host, but blech wish it would make a better first impression. choppiness on ie7 and ff2 btw. I know I’m being grumpy now, but – wouldn’t it be nice with a UI-lib that Didn’t start with flashy animations and slideshows and “carousels” etc and crafted more down-to-earth components? Fredrik – What you described is exactly what jQuery UI is. Enchant is not the whole UI suite. Hi everyone. We’ve received a ton of interest in jQuery UI and as such you may experience some slowness accessing the jQuery UI site. We are working to correct this and ask that you please be patient in the interim. 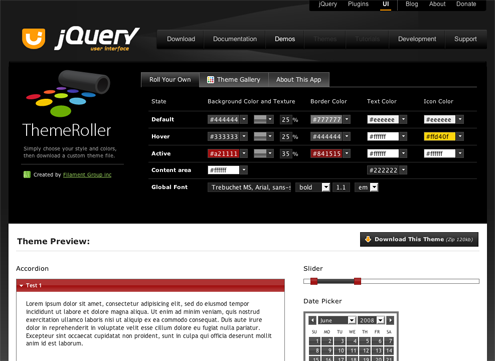 Jquery has come a long way and now making more ground breaking experience for all of us who uses Jquery..